Our product portfolio is based on the expertise of over 130 years of practice in the field of CO2 and dry ice. During this time, we have recognized that only a continuous development and improvement of products ensures our future and the success of our customers. Our ISO certification underlines our demand on our products and Services (IQNet ISO Certificate 9001:2008 and SQS Certificate ISO 9001:2008). Since 2007 we belong to the international industrial gas enterprise Messer Group and we are the competence centre for CO2. 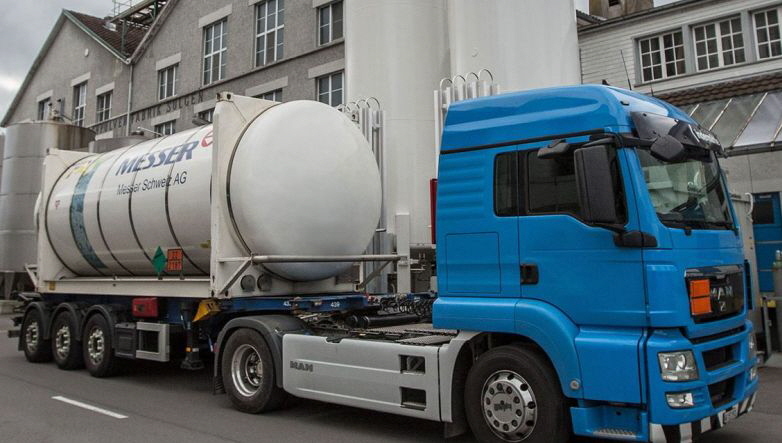 This merger with the German BUSE Gastek GmbH & Co. KG headquartered in Bad Hönningen, in 2014 allowed us to concentrate and substantially expand our expertise and product portfolio, especially on the complex field of CO2 recovery. Carbon dioxide is the combination of two atoms of oxygen joined with a single atom of carbon. Its chemical formula CO2, is almost as well-known as that of water, H2O, and it is frequently referred to by its formula rather than its name. In nature’s chain of life, the mutual dependence of plant and animal life is maintained through the link of carbon dioxide. Every time we breathe we release this gas, which plants need for life. Through the process of photosynthesis, the plants separate the carbon from the oxygen. In turn, plants release the pure oxygen, which we need to survive. We reverse the process, and by combining the oxygen with carbon from the foods we eat, produce carbon dioxide again. CO2 is a colourless, inert gas approximately 1 ½ times heavier than air and 0.03 % is present in the earth’s atmosphere. It is odorless, has a sweet biting taste (soda water) and is highly stable (difficult to separate). It is produced in varying amounts by the common process of combustion of fuels high in carbon content. The most common source of fuel for combustion is oil which, when mixed with the correct proportion of air, burns to produce around 15 % CO2 in the flue gases of a CO2 plant. After combustion has taken place, the CO2 can be separated from the flue gases and, through a simple process, made available for the many commercial purposes to which it can be applied. Advanced CO2 Production and Recovery Plants to gain high-purity CO2 for all industrial and food applications, individually adjusted to our customers’ requirements. The CO2 Production Plant is based on burning fossil fuel, such as diesel, kerosene or natural gas. 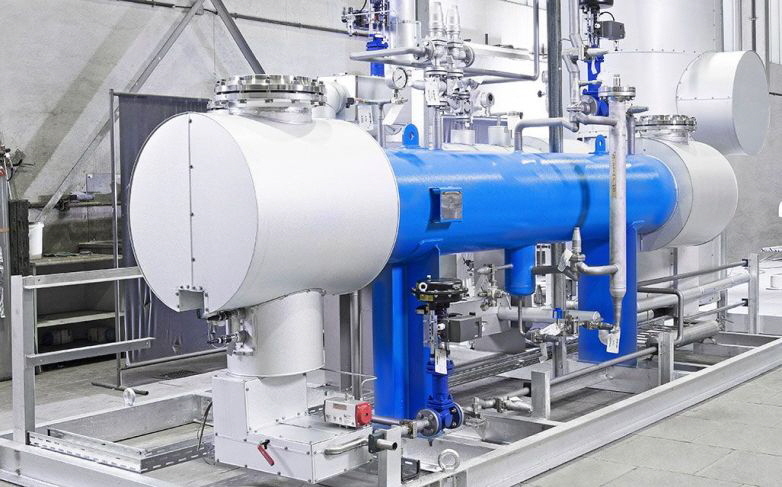 When no other source for recovery of CO2 is available, this self-contained CO2 Production Plant is the solution..
ASCO’s innovative ASCOSORB CO2 stack gas recovery technology turns your vent flue gas into a usable and profitable source of CO2. ASCO’s innovative CO2 gas recovery technology turns your vented by-product gas into profitable CO2. ASCO CO2 Gas Revert Recovery Systems are engineered to efficiently recover revert CO2 gas from dry ice pellet and block machines which normally direct the revert (flash) gas to the atmosphere. For a maximum of quality and flexibility in the daily working process and remarkable cost savings. As a provider of complete CO2 solutions we are not only your contact in regards to dry ice production machines in various capacities but also your competent partner for setting-up your in-house dry ice production. Dry ice is the name for solid CO2. At atmospheric pressure it has a temperature of approx. -79° C (-110,2 °F). The evaporisation is residue free. Dry ice is non toxic, non flammable, inert, tasteless and odourless. It is white and has a density of approx. 1'500 kg/m3 (93,64 lb/ft3) in its compact form. Dry ice is an ideal cooling media which can be used for many applications. It has a high cooling capacity. Dry ice blocks/slices or dry ice pellets are used for cooling purposes. 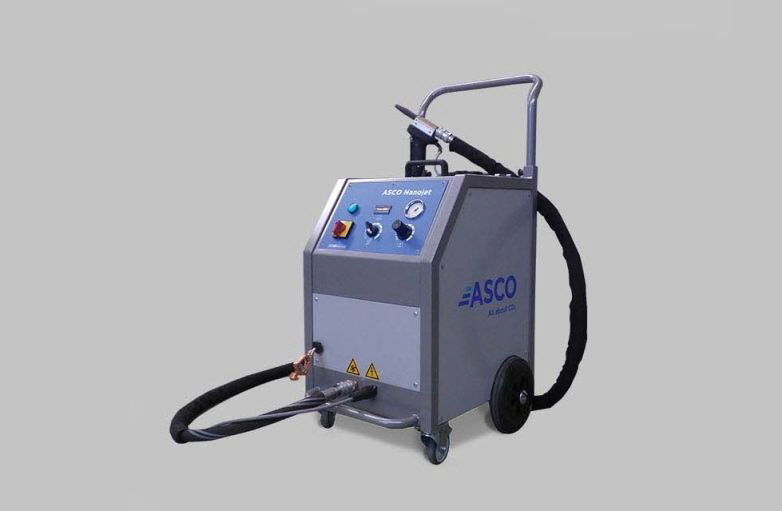 ASCO Dry Ice Blasting is a powerful, gentle, dry and ecologically friendly cleaning method causing no secondary waste. It is applied in many industries. For the cleaning of surfaces with our ASCO dry ice blasting technology dry ice pellets with the diameter of 3 mm (0,12 in) are standardly used. Dry ice pellets with a diameter of 1.7 mm (0,06 in) can also be used for the cleaning of delicate surfaces. For cooling purposes dry ice blocks and pellets with a bigger diameter are used. Dry ice is produced from liquid carbon dioxide (CO2). Inside a dry ice pelletizer, the liquid carbon dioxide is expanded under controlled conditions to form dry ice snow. This snow is then pressed through an extruder plate into round, hard pellets (elongated grains with a diameter of 3 mm or 1.7 mm according to the used extruder plate) for dry ice blasting purposes or into larger pellets/dry ice slices/blocks for cooling purposes. .
How does dry ice clean? The ASCO Dry Ice Blasting machine accelerates with compressed air the dry ice pellets to a speed of approx. 300 m/s (984,25 ft/s). The pellets hit the object to be cleaned. The surface is shock-frozen in a fraction of a second. Due to the sudden thermo shock generated on the surface to be cleaned, the coating/dirt contracts, becomes brittle and cracks. Due to the cracking of the surface, the pellets can reach under the dirt and remove it. The additional kinetic energy removes the coating/dirt from the surface. Immediately after impact, the pellet sublimates and goes back to atmosphere as a pure gas (CO2) without leaving any moisture behind. The only thing left is the coating/dirt removed from the surface and no blasting media has to be disposed of. Since the hardness of the pellets is only approx. 2 Mohs, the cleaning is virtually non-abrasive, and the surface quality is maintained. The dry ice pellets hit the surface with great speed and remove the detached coating and clean the surface material. “All about CO2” does not only mean a complete product range: above all it means complete and individual CO2 solutions including professional advice and best possible after sales attention. 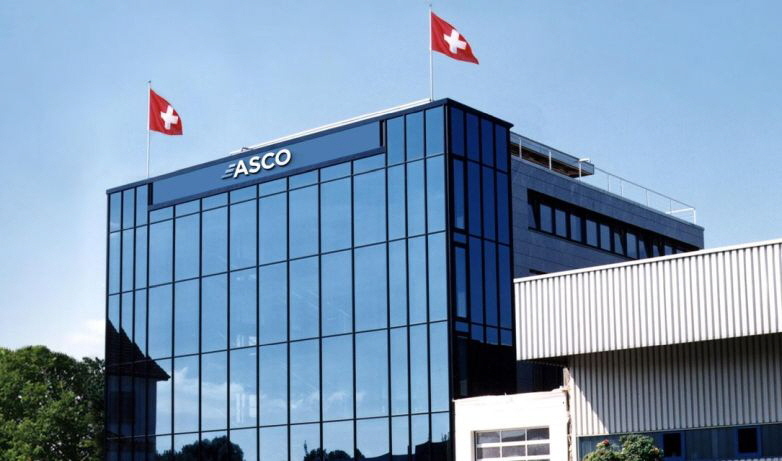 ASCO’s service does not end with the sale. True to our credo „All about CO2“ we offer various CO2 and dry ice equipment for any of your applications. True to our credo „All about CO2“ we offer various dry ice equipment for any of your applications. An in-house dry ice production starts paying at a need of several hundred kilograms dry ice per week. We are in a position to provide interesting all-in-all CO2 concepts and are pleased to find your most cost-saving solution for highest output whilst producing dry ice in-house. Our service does not end with a sale! ASCO provides with its After Sales Team a great service for your ASCO CO2 equipment. ASCO has most of the common spare parts on stock. This ensures a short delivery time to satisfy our customers. 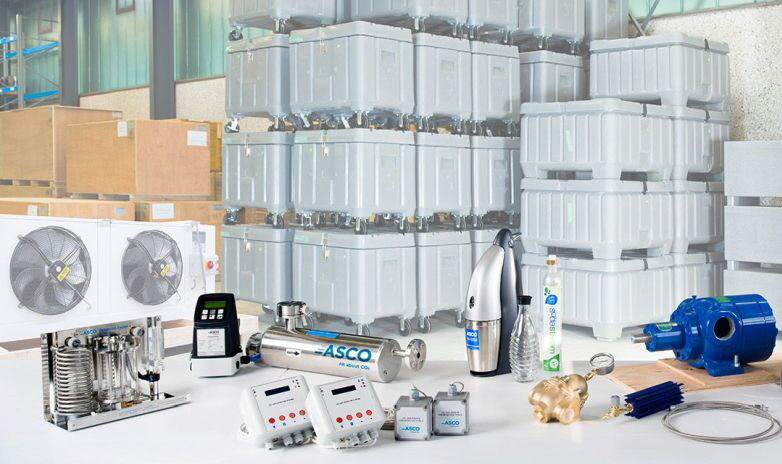 ASCO genuine spare parts help you to get maximum efficiency of your ASCO CO2 product.